If you have recently been injured in a Boca Raton car accident, you may be entitled to recover compensation by filing a personal injury claim. The only way to know for sure is to set up a consultation with an experienced attorney to discuss the facts of your case. It is in your best interest to do this sooner rather than later, while the details of the accident are still fresh in your mind. You should have collected evidence at the scene of the accident, but your initial consultation with your lawyer also gives you the opportunity to answer his or her questions to reveal more information. An experienced lawyer will have years of background representing clients in similar situations and can help guide you towards providing information that is most relevant to the accident claim at hand. You may be able to recover compensation, if you can successfully illustrate that the other party or other parties in the accident were negligent thus leading you to suffer critical injuries. You may be able to recover compensation to help you adjust to your life after the accident. One of the most difficult aspects of going through a car accident is that you may have pain that doesn’t have an official diagnosis but is persistent and dull, causing you numerous problems throughout the day. One of the most common ways for this to present after a car accident is in the form of neck pain. 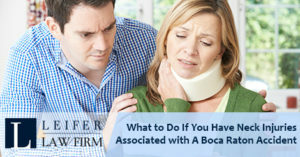 If you are suffering neck pain after a Boca Raton car accident, you may be eligible to file a personal injury claim. But you need to approach this issue very carefully and make sure that you have hired the right attorney to represent you. The right lawyer can have a significant impact on your ability to recover compensation and to move on with your life. Your attorney should have a background helping others in similar situations, recover successful settlements outside of court or successful verdicts in litigation. Of course, the individual facts of your case will influence your ability to recover compensation, but this is why having that all important first meeting with your lawyer can be so beneficial. If you have neck pain after a serious car accident, you may be wondering whether or not you have suffered whiplash which might also be referred to as whiplash associated disorder. This situation is relatively common with vehicle accidents as a result of the fact that it is caused by a jolting of the shoulders and neck. Whiplash could happen in any kind of car accident, but happens most frequently in rear-end accidents. This is because the impact of another vehicle striking you causes your body to move forward and the head moves just one second behind the rest of the body. Inertia from the accident’s impact forces the head to keep moving although your body will likely be stopped by the seat belt. This is where the term whip comes from in whiplash. As a result of the actions for your shoulder and neck muscles, your ligaments and tendons may become torn or sprain. A whiplash injury can be extremely deceiving because you might not notice symptoms right away. The shock of being in a car accident over the general pain you feel throughout your body after being involved in an accident can lead you to become seriously injured. A car accident is a traumatic event and the severity of your accident can be in various degrees. Seconds after a collision occurs, your adrenal glands will release cortisol and adrenaline in your blood stream. These hormones may mask pains that your body is able to react to what the brain perceives as danger. This numbing effect that occurs immediately after a car accident might lead you to think that you are okay. However, some of the common symptoms of whiplash may not be noticed until later on. If you need to build a personal injury claim for whiplash, it is essential to choose a qualified medical professional and get medical attention. Attend all of your doctor’s appointments and keep record of these as well as your own notes about your experiences and conversations with the doctor. These may become important components of your personal injury claim against another Boca Raton driver. If someone else was negligent behind the wheel and you have suffered the aftermath in the form of severe injuries, you need to consult with a knowledgeable lawyer as soon as possible. Consulting with an attorney is strongly recommended for anyone who finds themselves in this situation.